Mechanical structure is simple, very easy to install. The car comes with tachometer encoder. Uses four deceleration direct current machine curve to be nimble, the directivity is good. Four actuations, horsepower fullness. The chassis big and steady very easy to expand. STEP 3: Fix the motor to the chassis ,then insert and tighten the screws. STEP 4: Insert the screws and fix the battery container. STEP 5: Insert the spacer and tighten the 8 screws to fix the hammer caster.Hold tight and insert the motor(protection fastener) to the wheel . Educational toys, help to improve the ability of children, suitable for young people at key stages of heart development. With a car platform, add some micro-controller and sensor modules, and program it. Then you made your own robot car. 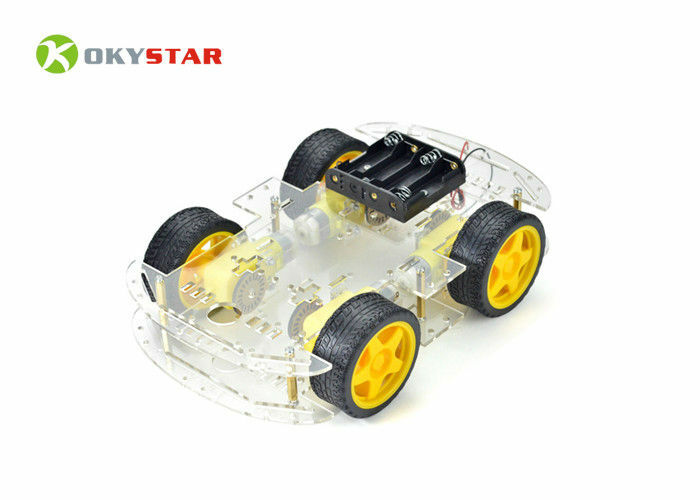 DC 6V 4-wheel Robot Smart Car Chassis Kits car with Speed Encoder. Educational kit for beginners(kid) to get hands-on experience about Robotics & Can extend electronics system like etc to realize function of tracing, obstacle avoidance, distance testing, speed testing, wireless remote control.